"I heard they are testing a new eye surgery for color blindness and are asking for volunteers. My friends are encouraging me to do it. They´re saying the grass is greener on the other side." No disrespect to anyone who suffers from this condition but as far as color goes, this healthy dish is bursting with it. This is a very healthy salsa dish which will give your day a real boost. The red jalapeños really give the kick here but the sweet corn and cherry tomatoes balance the flavor. 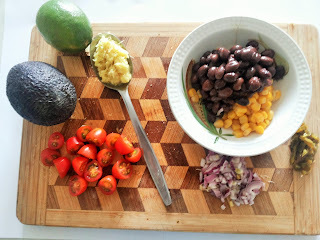 The preperation for the salsa is super quick and easy and it is interesting to know that a meal with so few ingredients can be so satisfying. 1. Combine chicken with 2 tablespoons each of oil and lemon juice in a shallow baking dish. Cover and marinate for 1 hour. 2. Heat 1 tablespook oil in a medium skillet or large frying pan. Add the corn, red jalpeño chillies and ginger; cook, stirring frequently until softened. 3. Heat a large frying pan to medium and add the marinated chicken, along with the oiland juice marinade. Fry until lightly browned and cooked through. Remove from heat. 4. Stir together black beans, red onion, corn, lime juice and 1 tablespoon oil. Add cherry tomatoes, avocadoes and 1/2 teaspoon salt (or to taste); season with black pepper and stir gently to combine. 5. Toss the rocket leaves with remaining 2 teaspoons each oil and lemon juice. 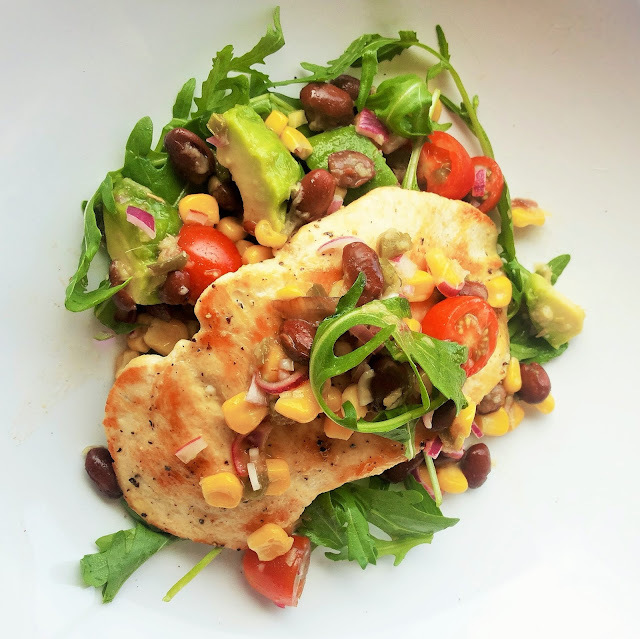 Divide evenly between plates and top with chicken and avocado corn salsa.